I want the SEC copied with ‘SF-04059’ in the header to lessen the changes that Parton and Pinkney will release altered documents. Per the SEC Order; the City had six months to properly account for the bond records and resubmit Bond Certificates of Completion and Financial Statements that were not Forged. The City then was directed by the Order to hire an outside Consultant to submit a Report to the SEC verifying that the City had fulfilled the requirements of the Cease and Desist Order. But all Beaumont City Council did was ‘Approve’ funneling taxpayer money to an out of state law firm on the theory that an out of state law firm would write and submit the Report to the SEC. 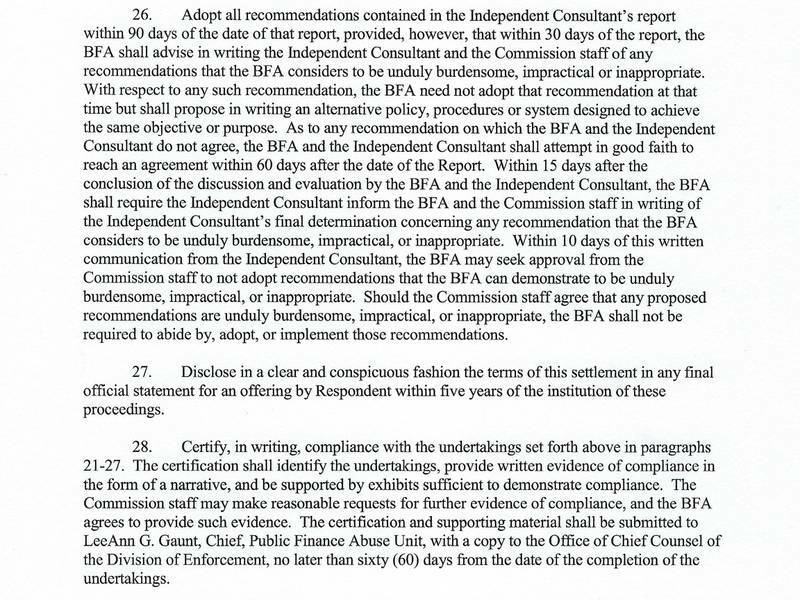 On February 20, 2018, the Beaumont City Council ‘Approved’ random pieces of paper after their Staff refused to release the Report prepared by the Independent Consultant per the SEC Cease and Desist Order No. 3-18132. Below is the Transcript of the February 20, 2018 City Council Meeting. The Council was not aware that it was the deadline and attempted to continue the Item until they could see the Report, but Beaumont City Attorney John Pinkney told the Council that they ‘had to’ Approve the random papers because it was the SEC deadline. Parton stated that he already submitted the Report to the SEC, but REFUSED to release the Report to the Council. If Beaumont City Manager Todd Parton sent documents to the SEC; they were never Approved by the Council. But nobody knows if a Report even exists because TO THIS DAY Parton has refused to release the Report. City Clerk Nicole Wheelwright: I want the SEC email addresses copied at the release of the SEC Cease and Desist Compliance Report with ‘SF-04059’ in the header to lessen the changes that Parton and Pinkney will release altered documents. 2:00:45 Mayor Nancy Carroll: Do I have a Motion to Ratify the Attached Policy with the expansion of detail that was requested by Council Member White? 2:01:00 Councilman lloyd White: I would like to see it before I approve it. Carroll: Okay, did you want it to come back to Council? Councilman Julio Martinez: Move to Continue. City Attorney John Pinkney: We need to get this Approved to comply with the Cease and Desist Order from the SEC and then if additional items are needed to be brought back to you, they can do that, but we need to get this Approved. Martinez: so do we give direction to add that in? City Manger Todd Parton: There’s two issues that I think we’re kind of cross-wiring here a little bit. These are SEC Compliance issues pursuant to the Order that are specifically pursuant to the land secured financing. 2:02:00 Parton: I think what we’re talking about is a broader policy on all debt issuance whether it’s the BFA or the City or through the Beaumont Utility Authority. So I think that we’ve talked about internally about taking these specific policies and also expanding those out to apply to all bond programs, so we’re specifically looking at the land secured stuff. So I think there’s a whole other body of work we need to come back and really begin to expand those into all debt issuance programs of the City moving forward because we’re going to have to look at some of that. I mean we talked about utility bonds that need to be issued in reference to the Sewer Plant improvements. There’s some other actions along the debt line that is going to have to be considered at some point. Martinez: So the final product has to be approved by us [the Council] anyway, correct? Parton: We would want to bring everything back to you. Martinez: So at that point if it’s not in there where we want it, it’s going to be approved, so I guess we can look at it then. 2:03:00 White: What is your timeframe on this being completed as far as meeting the SEC deadline? White: We had a number of days for the deadline. Where are we on that? Libi: Today. It’s today, February 20th. Parton: So the Reports have been drafted and have been submitted back to the SEC already. Parton: This initial policy, which was a directive that it be included with the packet. It’s been included and submitted to the SEC with the knowledge that this is going to be considered tonight at Council. Carroll: I need a Motion. 2:04:00 White: I’ll move to Approve the attached policy.